The ELD-X® (Extremely Low Drag - eXpanding) bullet is a technologically advanced, match accurate, ALL-RANGE hunting bullet featuring highest-in-class ballistic coefficients and consistent, controlled expansion at ALL practical hunting distances. Verified by Doppler radar, the Heat Shield® tip is immune to the effects of aerodynamic heating and retains its shape to maintain the highest-in-class BC over its entire trajectory. Streamlined secant ogive with optimum boattail design + highly concentric AMP® bullet jackets + Heat Shield® tip combine for radically superior aerodynamic efficiency. ELD-X bullets are available in factory loaded Precision Hunter ammunition. 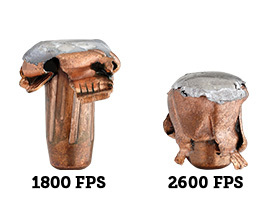 With high velocity 0-400 yard impact, the bullet continually expands throughout its penetration path. The thick shank of the jacket and high InterLock® ring keep the core and jacket together providing 50-60% weight retention. Upon low-velocity 400+ yard impacts, the Heat Shield® tip drives backward into the bullet to initiate expansion. Exhibiting conventional expansion with a large mushroom and 85-90% retained weight the bullet provides deep penetration and large wound cavities.